Stephen Daisley on how a pro-independence blog is shaking up the Scottish media landscape. 1) How much do you get paid? 2) Is there an apostrophe in St Andrews? 3) Is Rod Stewart Scottish? To this we can now add a fourth: Is Wings over Scotland a legitimate news site? For the uninitiated, Wings over Scotland is a pro-independence blog that practises a brand of political journalism pitched somewhere between Gonzo and WWE. Run by former games reviewer Stuart Campbell from his base in Bath, Somerset – a fact his critics never tire of highlighting – Wings is the home of cybernationalism, where the most committed can revel in outrage about BBC bias, Unionist perfidy, and the manifold wickedness of Westminster. Campbell’s site is back in the (mainstream) news after comments he tweeted about Conservative MSP Alex Johnstone during the politician’s Tuesday appearance on Scotland Tonight. "I believe in nuclear disarmament", lies fat troughing scum Alex Johnstone MSP. The Herald reports that Yes Scotland has now "distance[d] itself" from Campbell, instructing a local branch of the pro-independence campaign to stop distributing leaflets recommending Wings to members of the public. This news will be greeted with glee by those who despise – and there is genuine hatred amongst some Unionists – Campbell’s brand of kidney-punch polemicism. Serves him right. Poison-pusher. Hate-spewing cybernat. It is understandable that some take offence at Campbell’s belligerent style and profane language (some of his tweets would make a sailor blush). Some will have encountered him for the first time last week in his broadside against Clare Lally, the Labour activist, “ordinary mum”, and non-relative of former Glasgow Provost Pat Lally – and they may have recoiled at an unseemly choice for a monstering. But readers do not turn to Wings over Scotland for political moderation or journalistic etiquette. It's brash, aggressive, personal. Other blogs shoot from the hip; Wings shoots its targets in the hip. Campbell is angry but it’s a genuine anger. Whatever one thinks of his politics or rhetoric, he cannot be charged with inauthenticity. If his site is where political doubt goes to die, that is because a sizeable number of Scots feel their views (left, nationalist, counter-hegemonic) are not reflected in the mainstream media and yearn for a full-throated articulation of a radical Yes position. The battlefield is no place for self-doubt. Wings is arguably the most exciting, invigorating, and innovative entrant to the Scottish media world in recent years. Bella Caledonia and National Collective contribute intellectual firepower to the Yes cause but they perhaps lack the killer instinct. Campbell takes Unionists out at the knees. An open secret about Wings over Scotland is that it increasingly rivals newspapers like the Herald and the Scotsman for insider knowledge (mostly Yes/SNP) and media influence (across the board). Few will admit it but almost every political journalist reads it, from news editors looking for stories to follow up to producers keen to keep on top of the big political issues of the day. Its forensic and partisan deconstructions of No campaign messages and media reporting – Campbell doesn’t see much difference – are informative and infuriating in equal measure. Campbell, the inveigher against the hated mainstream media or "MSM", is now an integral part of the media landscape. Plenty of hacks disapprove but they have little say in the matter. This is a function of the radical changes which the news industry is undergoing. Newspapers are facing ageing and declining readerships, advertisers abandoning ship, diminished resources, downsizing, closures, and the emergence of a generation not raised in the paper-reading habit. Wings is crowd-funded and is believed to have set a record by raising around £100,000 in the space of a few weeks in February and March. This means it can fund its own opinion polls and commission outside contributors. Broadcasters, who face some of these challenges too, are also hemmed in by regulations which do not extend to bloggers. The rules are clear: Broadcasters must show due impartiality to both sides. This means Campbell need not mind his journalistic Ps and Qs. Yes Scotland is free to associate with or distance itself from whichever websites it wants. But for the Scottish news media, Wings over Scotland presents practical questions which can’t be ignored any longer. Who is a journalist? What constitutes news? What does objectivity mean in practice? Should the news media even be striving for objectivity or should journalism be as much about analysis and context as reporting facts? How should journalists respond to watchdog bloggers and critics? The media landscape has been transformed irrevocably by the digital democratisation brought by the internet. Mainstream media need not embrace Stuart Campbell but it cannot afford to ignore him or the challenges he poses to journalistic practice. 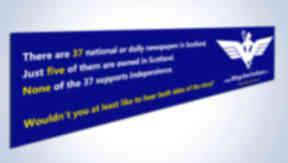 The referendum has given life to alternative media and none has flourished quite like Wings over Scotland. And, however much its critics might wish, it’s not going to fly away any time soon.